Halong Bay is a the most famous tourist attraction in Vietnam. What Halong Bay offered hard to match anywhere else in the region. Halong Bay has a natural beauty that is a blend of the beauty of the sea, towering limestone mountains, virgin forests, caves, and lakes are surrounded by hills. 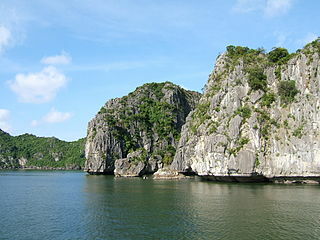 In addition, Halong Bay also save a lot of legends stories, even a love story that is trusted by local people. The most famous legend is of course the story of Halong Bay formation with the arrival of the dragon family who helped the Vietnamese to repel enemy attacks. But other than that, there are many interesting stories behind the enchanting beauty of this bay. Almost every cave and island has its own legend. The legend that is also diverse. There is a love story between two lovers, the story of the marriage between humans and dragons, epic, and even the legend of the golden turtle that is a continuation of the story of the legend of Hoan Kiem Lake in Hanoi. Of course we do not know whether these legends are all true. However, the nuance of Halong Bay which may seem mystical and mysterious, this bay is very suitable to be used as background romantic story. Although most of the story is a myth, of course there is also a reality. Acts of heroism in countering enemy attacks, how the topography of Halong Bay which serves as a Vietnam defence bulwark is certainly true story comes from ancient times. Maybe there are people who believe in the stories of the people in this place, some are not. However, they will only agree to one thing that is the beauty of Halong Bay so extraordinary.